How do you allow musical ideas to flower – technically, creatively, and when finding your musical voice? The floral images reflected in visuals and sound in Christopher Willits’ “Tiger Flower Circle Sun” are evocative imagery, but also an apt metaphor for Willits’ artistic process. The composer and artist spins unique, organic ambient worlds with layers of sound and pattern, transforming the timbres of his guitar. He’s also known for making custom software to craft his results, a prolific patcher in Max/MSP with a regular series on Ableton Live, Max, Max for Live, guitar recording, touring, and other topics translated to friendly how-tos on XLR8R TV. I got a chance to talk to Christopher about the technical and inspirational alike, reflecting on the new record. PK: Let’s talk a bit about your approach to production as a guitarist. Part of what I love about your work, live and in the studio, is the way in which the instrument is interwoven with the music. In this album, what’s the relationship of the input to output? How much is live playing; how much is after-the-fact production work? CW: When I’m developing new ideas, I’m always playing guitar and processing it, and recording it out … then I either let it be as-is, or develop it further. It’s like throwing out all of these seeds. Some grow into things and others decompose back into the soil and help the others along in a less direct way. I have no expectation about where things will go when I’m in the experimenting / play phase of working. Sometimes I don’t even know that I’m in it. I’m just playing guitar and then something will stick and begin to resonate. All of these pieces began through this method. None of the guitars that you hear have been processed after-the-fact; it’s all a live, in-the-moment process of recording the guitars through software. I want the life of those recordings shining through, [rather than it being] overworked. As far as the guitar itself, any comments on tuning, timbre, and how you handle the instrument itself? Pretty straight up, standard tuning, A 440. I used my strat mostly and baritone for some depth here and there. Naturally, I’m interested in your software creations for this record, as you’ve been a vocal advocate of Max patching. What sorts of contraptions are involved here? New Max patches? Using Max standalone, Max for Live, or a combination? Most of the processed guitars were created before I dug into Max for Live. So these processing patterns were developed through plug-ins I made with Max that I use with Ableton Live, as my mixer and sequencer / workstation. 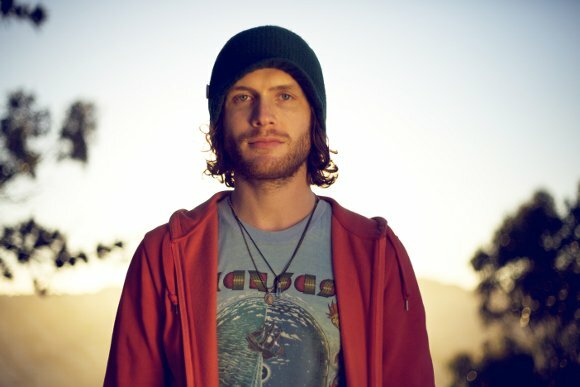 Just to pull something out timbrally – “Heart Connects to Head” nicely represents some of the juxtoposition of organic and electronic sounds for me, in particular the synth arpeggio with percussion. Can you share some of your sound sources here, or in general how you view the ensemble? That synth was Operator in Ableton Live, being played by my guitar with a MIDI pickup, an Arpeggiator MIDI effect on it, while the guitar output was running through some spectral smashing-ness. So the bass synth, and chords are all recorded live in one flow, the guitar triggering the bass and the processed string vibrations together. 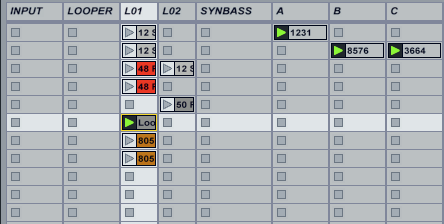 There’s a lot of microsampling going on, and percussive elements. Is this reflected in the software? How do you conceive the rhythmic activities of the record? Some of it is from the Max plugs processing shards of guitar; others are recordings that I made — I EQ’d [them] and adjusted the envelopes into percussive ticks that occupied the right space for the music. The percussive elements created spinning wheels, often in different directions from other melodic elements. These events for me create an opening into the patterns. Even the simplest triple click low in the mix can rotate and open up more surfaces to feel. A couple of the tracks seem to burst into vocals; can you talk about what motivated these differently? I was not attached to any sonic outcome with this record, and there was no plan to even use vocals, but at certain times i heard these big words, multiple people singing them. And it was really important to me that more than two people were singing these parts. There’s a liquid sense of tonality to me, a sense of harmonic freedom. Can you talk about your harmonic influences, and how these evolve in these tracks compositionally? The creative process is mysterious, but I know it does require devotion and love and time, and surrendering control. I feel like the music tells me what to do. I follow my intuition and the music either embraces it or challenges the adjustments / additions / subtractions. It’s an amazing process for me; nothing short of magic, really. With an intention and with some focus, love, and time. these things grow. The harmonic vibrations attract other vibrations and the flow keeps flowing. Maybe my influences come out in this process, but that is never intentional. There is music I love — like Coltrane, Hendrix, Stereolab, Tortoise, Sun Ra, Steve Reich, Yoruba Andabo — that I can hear relationships to. Obviously, you work a lot with visual imagery in your work and in your performance, and there are some evocative titles in the tracks and the album itself. Did specific visual images feed into your musical conceptions here? Yes, definitely — images that were woven into imagining and intuiting what the music was opening up to. I’ve been shooting tons of video and composing video pieces for these sounds. Throughout the rest of the year, I’ll be releasing these videos. nowness.com featured it recently and it’s on my YouTube channel. What does your hardware rig look like in preparing for this album? What’s your software rig? Adam at Guitar Geek did a pretty good job last year detailing my hardware setup. it has changed a little, but this is a good overview. Software modules I’m designing, now in Max for Live, are mostly time domain-folding plugs. Sound is recorded in and I index to different locations using delays, jump-cutting buffers, and granular techniques. I also work on weird spectral morphs with convolution techniques, brittle odd and even-harmonic distortion, and different MIDI input from the guitar to alter filtration settings. These seem to be the processing machines that I’m always gravitating towards. I used these plugs in about 12 audio tracks with input-only monitoring, with both dry guitar input and looped guitar, fed via return tracks. I then added extra tracks in Live for percussion recording and sequencing, vocal recording, baritone, synths, etc. Guitar Geek examines Christopher’s rig. Image courtesy Christopher Willits; source/(C): Guitar Geek. 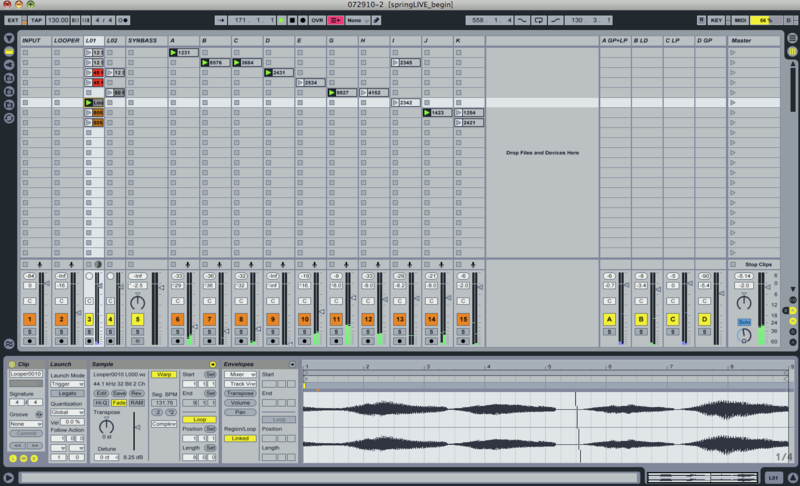 Chris’ Ableton Live setup combines live inputs and Max devices to produce his layered sound. Click for full-sized version. How will you adapt the hardware/software setup for this material for live performance? 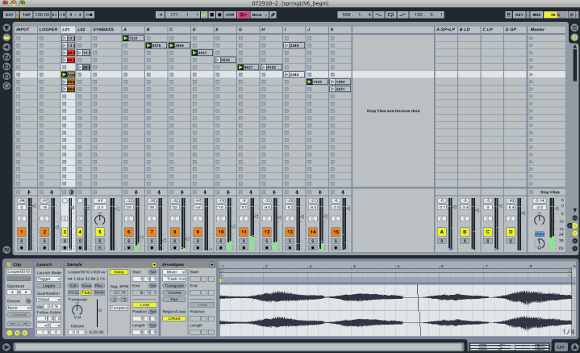 The system i use live is very similar to the recording setup, but without the extra tracks for supporting instruments. The hardware setup will be scaled down for easier traveling. [Behringer] FCB 1010 when I’m sitting in a chair or standing up while playing. I’m experimenting a lot with sitting down and standing up in the last few years. Both feel good for different situations. Some of the material I can play solo; other tracks need the stacked vocals and other elements, so I’ll wait until a band tour is dialed in for that. I’m really interested in playing with percussion lately. I either meet up with different percussionists, bring friends along, recruit audience members, or all of the above. In the last performance I had at twin space in san francisco, [I brought in] eleven audience members. How do you see this album fitting in with your previous work? I feel this album is a natural progression from everything I’ve been doing. That growth is not a linear. I’m more interested in creating a bunch of supporting branches of art flowing in a similar direction, rather than one main limb with only a few flowers. TFCS brings together all of the sounds that I love into one statement, perhaps the most concise that I have made yet. And the really fun thing for me to think about is that I feel like I am just now beginning. After ten years of making records as a solo artist and in collaboration with some of my best friends, I’ve really honed my voice and focus and I can only imagine what the next 10 years is going to bring.